SEDGWICK, ROBERT, Puritan, merchant, soldier, and colonist; led the English conquest of Acadia in 1654; b. 1611 at Woburn, Bedfordshire, England, son of William Sedgwick and Elizabeth Howe; d. 24 May 1656. Sedgwick’s deep Puritan convictions led him to New England at the age of 24, after a brief mercantile career in London, where he was a member of one of the militia companies. He resided in Massachusetts from 1636 to 1653, held several political offices, helped build its militia, and became major-general of the colony in 1652. As a merchant he pioneered in the development of the New England fishery and invested in several local enterprises. In 1653–54 Sedgwick visited England, then at war with the Dutch. Because New Haven had petitioned Cromwell to reduce her rival, New Netherland, Sedgwick was sent to New England to organize an expedition against the Dutch colony, but news of peace overtook him in Boston. 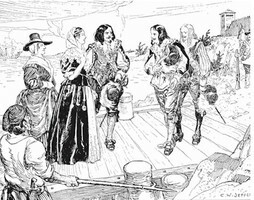 Since his commission from Cromwell of 8 Feb. 1653/54, as general of the fleet and commander-in-chief of all the New England coast, authorized him to make reprisals against French commerce for attacks on English vessels by French privateers commissioned by princes Rupert and Charles, he resolved to use this power to secure the rich fur-trading and fishing resources of Acadia for New England and the Protectorate. Charles de Saint-Étienne de La Tour controlled Acadia at this time, but his defences were weak. He had outlasted his rival, Charles de Menou d’Aulnay, only to suffer attack by d’Aulnay’s creditor, the La Rochelle merchant Emmanuel Le Borgne. Sedgwick left Boston on 4 July 1654 with 170 men in three ships and a ketch. In ten days he reached the Saint John River where he found La Tour in his fort. Three days later La Tour and 70 fighting men surrendered. On 31 July Sedgwick’s expedition sailed to Port-Royal (now Annapolis Royal, N.S.). Sedgwick was ambushed but won and took the fort. He then sailed to Pentagouet on the Penobscot, which he took on 2 September. He plundered the forts of their goods to the value of about £10,000. Early in September he was back in Boston; the General Court of Massachusetts ordered a thanksgiving for 20 September. His son-in-law, Major John Leverett, was appointed military governor of Acadia and Sedwick left for England, taking La Tour with him. 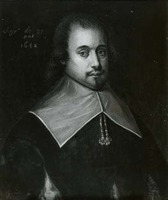 Cromwell welcomed Sedgwick because possession of Acadia provided additional bargaining power in negotiating with France. The Protectorate agreed to recognize La Tour’s title to Nova Scotia under his grant from Sir William Alexander, Earl of Stirling, if he would undertake to reimburse Sedgwick for the cost of the conquest, nearly £1,800. 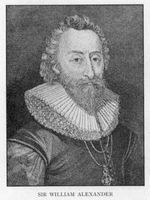 This led La Tour to sell his rights to Sir Thomas Temple and Col. William Crowne, who became proprietors of Nova Scotia for the next 14 years. Sedgwick was rewarded with command of an expedition to reinforce William Penn and Robert Venables against the Spanish in the West Indies. Ultimately Cromwell appointed him supreme military commander in Jamaica but Sedgwick died on 24 May 1656, shortly after receiving the commission. For information on Sedgwick’s conquest of Acadia see Bodleian Library, Rawlinson mss, A16, f.52; A18, f.58. Mass. Hist. Soc., Gay Papers. Thomas Birch, A collection of the state papers of John Thurloe, Esq., secretary to the Council of State and the two protectors Oliver and Richard Cromwell . . . (7v., London, 1742). Coll. de manuscrits relatifs à la Nouv.-France, I, 145–49; II, 358–59. Documentary history of Maine, IV, VI, VII, X. Maine Hist. Soc. Coll., lst ser., V, 231. Mémoires des commissaires, I, 56; IV, 499; and Memorials of the English and French commissaries, I, 126, 525. PRO, CSP, Col., 1574–1660. For other aspects of Sedgwick’s career, see: Suffolk deeds, I, 20, 45. Bernard Bailyn, The New England merchants in the seventeenth century (Cambridge, Mass., 1955). DAB. DNB, 1st Supp., III. Oliver A. Roberts, History of the Military Company of the Massachusetts, now called the Ancient and Honorable Artillery Company of Massachusetts, 1637–1888 (4v., Boston, 1895–1901), I. Henry D. Sedgwick, “Robert Sedgwick,” Col. Soc. Mass. Pub., III (1895–97), 156–73. William I. Roberts, 3rd, “SEDGWICK, ROBERT,” in Dictionary of Canadian Biography, vol. 1, University of Toronto/Université Laval, 2003–, accessed April 20, 2019, http://www.biographi.ca/en/bio/sedgwick_robert_1E.html.